Cross country... the best of all human endeavors! Traditionalists... your event distance choice of 5 Kilometers or 15 Kilometers. Ultra consideration... our Gratuitous 6-Hour option for ultra runners with a 8:00 am starting time. Space for ~150 eager runners... permit restrictions limit race participation to the first 150 registrants, which is a total combined count of participants within all events. Colorful one-of-a-kind race shirts for all registered runners and volunteers. Chip timing & scoring with instant results published here, on RunRace.net for all participants. Overall awards... presented to top male & female, open and masters. Age division awards... 10-year age groups for both sexes, with depth determined by number of participants. Team awards... for top teams based upon 3 scoring in 5 member teams. Ultra awards... for those who tally more than 26.2 miles in our Gratuitous 6-Hour run. Afterward... post-race celebration with fun and awards. Registration opens on Black Friday and lasts through 6:00 pm on Saturday, the day before race day, here on our RunRace Network. Due to permit restrictions we cannot offer race-day registration. The Forest Preserve District of Cook County has granted pre-approval for our intended racecourse and start/finish area. You may view a map of our racecourse below. Note: Plenty of parking is available within the extensive lot of Bunker Hill, which has entrances off Caldwell Ave and Harts Rd. 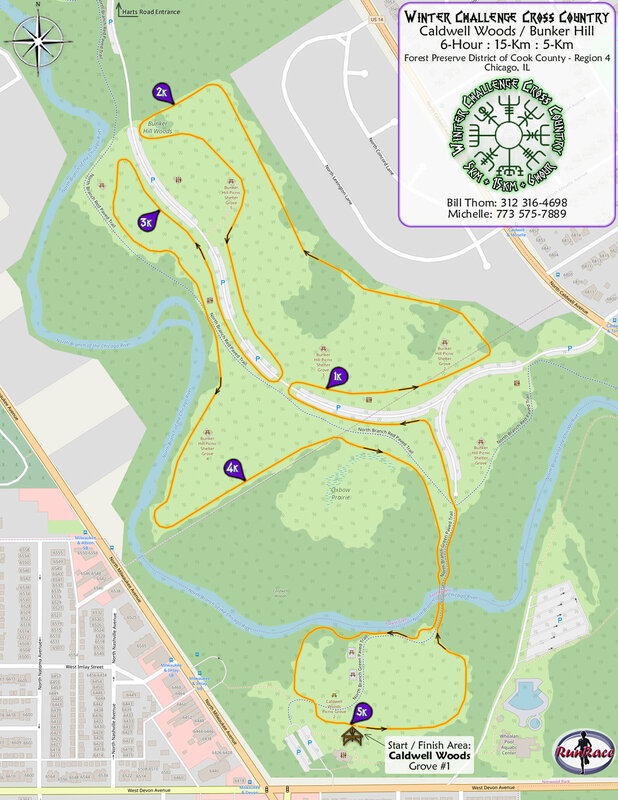 Limited parking exists at Caldwell Woods, which has its entrance off Devon Ave.
Our Winter Challenge Cross Country runs takes place entirely within Region 4: North Cook County, nearby the North Branch Trail system of the Forest Preserve District of Cook County, in Chicago. Winter Challenge Cross Country is ideal for off-road/trail runners, and those experienced runners looking to compete with their teammates under cross country conditions. Our racecourse is intended to be a 5-Km loop on grassy fields -but- may be rerouted to the paved trails should wintertime conditions dictate. Either way, participants can expect a clearly marked course -and- should be prepared for challenging seasonal conditions. Gratuitous 6-Hour runners will repeat the course for as many laps as they can, then may switch to a quarter-mile loop as the clock winds down from six hours -to- zero. Q.) What is cross country running? A.) We believe it to be "the best of all human endeavors!" For further definition we're going to turn it over to crowd sourcing... click for Cross Country Running on the website of Wikipedia. Q.) Do I have to run on a team? A.) No... solo runners are encouraged to participate, and all participants will be timed/scored to determine their finishing place. All runners will be vying for overall and age group awards. Q.) Can I participate as a walker? A.) Yes... walkers are invited to experience the wintertime beauty of our racecourse. We recommend that walkers opt for our 5-Km event distance. However, because our racecourse will be open until 2:00 pm, walkers can choose participation in our 15-Km or 6-Hour event. Q.) Will this race be cancelled or postponed due to extreme weather conditions? A.) Not likely... as outdoor winter enthusiasts we have contingency plans. Should conditions dictate we may have to reroute our racecourse from grassy fields to paved trails and/or shorten the distance of our racecourse loop. 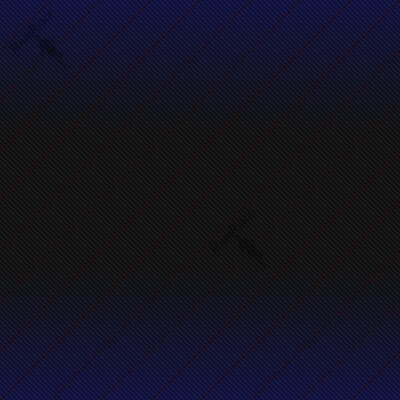 In any case our event distances will remain as defined. Participants can expect a clearly marked course and should be prepared for challenging seasonal conditions. We have arranged for race-day access to the warming shelter and its bathrooms within the building atop the hill, near our start/finish pavilion at Caldwell Woods, Grove #1. Q.) How does team scoring work? A.) Great question. For our traditional distances of 5-Km and 15-Km, teams may contain 3 -to- 5 runners. We'll sum finishing times of each team's fastest 3 runners, and that total will determine the team's point value. Lower the point value... better the team. For our Gratuitous 6-Hour event, teams are made up of 2 runners. We'll sum teammates accumulated mileage to determine the team's total. Higher the mileage... better the team.